For some people writing an argumentative essays is really complicated task. I know from my own experience that success of essays depends on the topic that you pick. Sometimes people feel uncomfortable with their essay topic. I think in such case it's better to choose another topic for writing. If you don't have a lot of time for searching good topics, here you will find a big list of them. 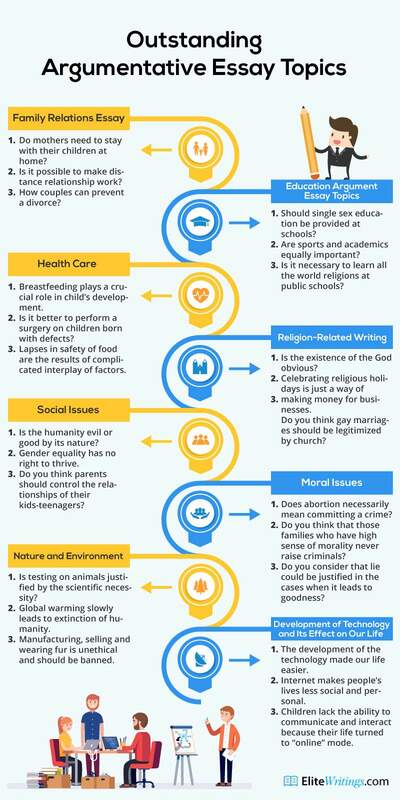 This inforgraphic image contains information about argumentative essays with twenty-four topics. For instance, there are topics about social issues, religion-related writing, development of technology and its effect on our life, nature and environment, moral issues, health and care, family relation essays and education argument essays topics. I must say these topics are major and encouraged to write good arguments. In addition, this infographic image can be helpful for students or professros who search for something new. I hope that this information will help people to write interestinf argumentative essays. Good luck!